For centuries, the Chinese believe that fish tanks can attract good luck and abundance. This belief has been passed down from ancient Chinese Feng Shui masters. Water in the tank is considered one of the best magnets of wealth and prosperity in the household. It signifies the flow of life, health, wealth and prosperity. Water is considered one of the five important elements of Feng Shui that also include wood, metal, earth and fire. Aside from water, the other elements are represented by driftwood and plants (wood) and rocks or tank accessories made of metal (metal). Aquarium substrate (rocks and/or gravel) also represents the earth element while the fire element is found in the bright colours of its aquatic inhabitants. Your choice of fish species can enhance the energy benefits which are attracted by the water in the tank. Red or orange-coloured fishes are believed to bring in the fire element. The presence of these five elements in the tank is believed to create an ambiance of balance, harmony and good health. A correctly placed fish tank does not only counteract the negative energy that may threaten all the aspects of life and home but also act as an enhancer and balancer of the five elements. The water inside the tank also acts as a pool where positive energy is gathered and kept. The placement of a fish tank determines how much positive energy it can attract. Feng shui experts use a bagua map to find the best locations in a home. Basically, it is a map that divides the house into nine sections, with each section corresponding to life's treasures. These treasures include health, family, fame and reputation, prosperity, love and marriage, creativity, children, travel, career and knowledge. The prominent element in a fish tank is the water that it contains rather than its inhabitants. Since water symbolizes money, place your tank in areas of your home signified by the bagua map as wealth or career areas. In conventionally-designed homes, the map indicates the back left section of your home as the area for wealth and prosperity. The water element is also believed to have an effect on the health of the family members, thus you can also place your tank in the area indicated by the map as family. 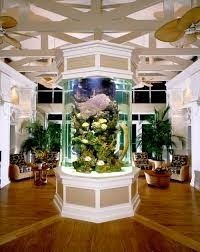 One of the best locations to place an aquarium is close to the front door to attract wealth. Other outstanding locations include the east sector that represents health and family, southeast for accumulated wealth, and north sector for career and generating wealth. Feng Shui masters also suggest placing a fish tank in the south-eastern part of your home, a place that represents abundance. However, some Feng Shui experts warn against placing a fish tank in the bathroom, kitchen or bedroom. These areas are associated with negative energy and should be avoided. Placing a fish tank in any of these places can attract, create and multiply problems thereby hindering your success. An aquarium facing the front door attracts positive energy while blocking the energy from passing right through the back door. This is also the reason for placing an aquarium between two areas of the house (e.g. between the living room and dining room). Since exterior structures such as lamp posts, bridges, or sharp corners of another house are sources of negative energy, an aquarium can be placed suitably to block off the negative "Qi". An aquarium placed right under an exposed beam of the house can help dissolve mental pressure while calming and soothing the mind.